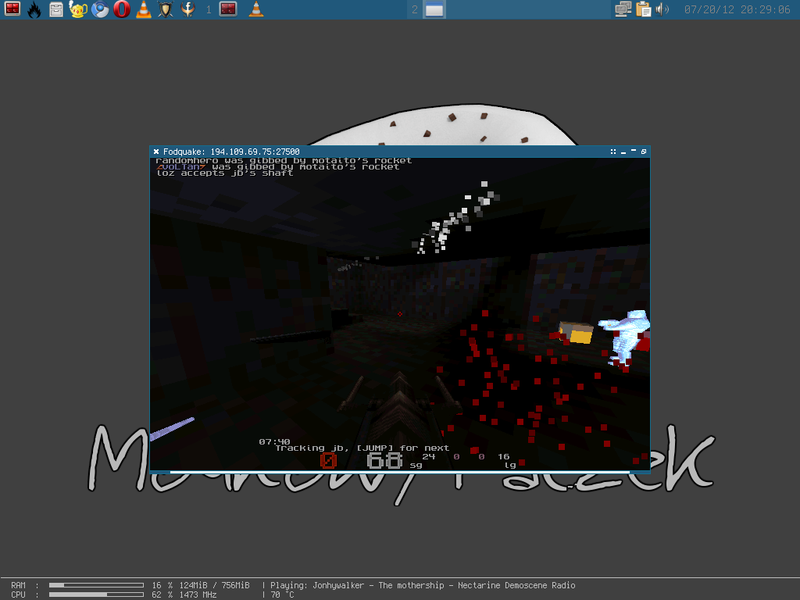 The bestest QuakeWorld client in the ez world. Digitally boxed Fodquake is now available from classicQ! Comes with a new power! Console with funky thing support, death of hunk/zone system from the ancient MSDOS times, improved Linux sound support, flat map rendering, greater than great Server browser, clean code and new platform support. Read more in RELEASENOTES-0.3 and CHANGES. Release binaries are available in our downloads. Mac OS X is now supported. Test binaries are available in our downloads. We have launched Fodquake website. Server browser - to easily find a match or a player. Sorting by gametype, columns. Friends tab to keeping your mates there. Customizable colours. Join, observe, search, watch EzTV streams via QTV proxy. QW networking independent from rendering. 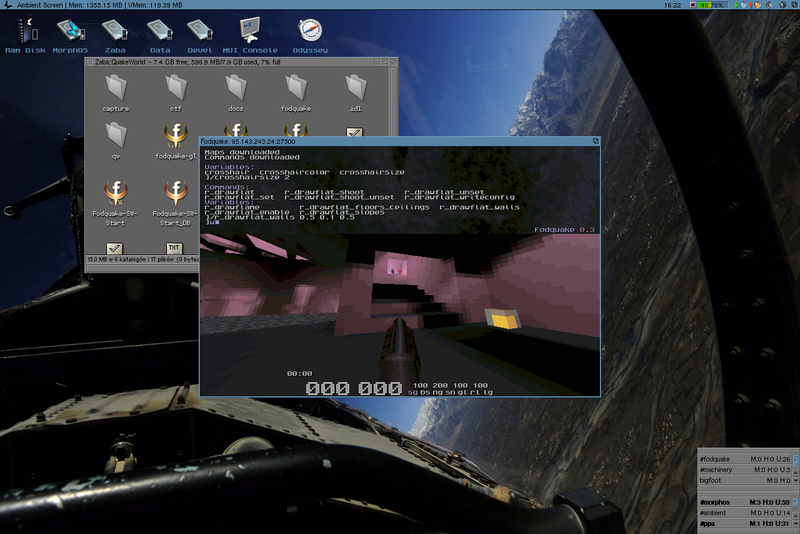 Flat rendering of maps, in both OpenGL and software rendering, with the user being able to either choose distinct colours for walls, floors/ceilings and slopes, or choosing to colour each surface on the entire map according to their wish. Command line arguments are no longer needed. 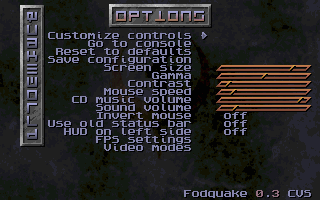 Every option can be set by regular Quake cvars. Command line options are converted into their respective cvars for legacy reasons. Sound system parameters can be changed while Quake is running and sound can be completely turned on/off as well without a restart. Linux USB mouse poll rate settings are checked and a warning is given if found to be lower than 500Hz. Table layout code with optimal layout and entry sorting. Tab completion of commands and variables and other things presenting the output in a grid will use the new table layout code. FTE-compatible support for compression of network data. Support for FTE chunked downloads. Downloads can be much faster on compatible servers. No longer lets broken mods (hint: they start with the letters 'kt') change the rate cvar. If the server asks for the cvar to be changed, only the userinfo will be changed, and the value will be restored when disconneting from the server. 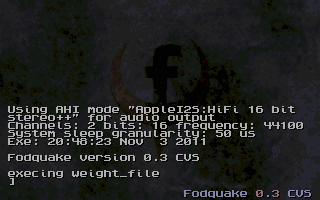 Q: Why do I get "Error: W_LoadWadFile: couldn't load gfx.wad" when trying to run Fodquake? Fodquake/id1/ directory on AROS and MorphOS. ~/.fodquake/id1 directory on FreeBSD and Linux. ~/Library/Application\ Support/Fodquake/id1/ directory on Mac OS X. My Documents/Fodquake/id1 directory on Windows. Q: Why do I get "Error: Mod_ForName: NULL name" when trying to load a map using map command? A: Fodquake doesn't support local games yet. Q: How do I save a default configuration? A: Go to options and use "Save configuration" or type cfg_save default.cfg to save it as a default configuration. Q: How do I load a configuration? Q: Where do I put a myconfig.cfg? A: Copy your myconfig.cfg to PathDependsOnYourSystem/Fodquake/fodquake/configs/ directory. Q: How to start commands automatically at startup? A: You can put commands you want to autostart in PathDependsOnYourSystem/Fodquake/fodquake/autoexec.cfg. Q: When I take quad the screen goes blue and when i have pent it goes red. What's the command to prevent the screen from changing color? A: v_pentcshift 0; v_quadcshift 0. You can also use values like 0.5 which will give you slightly less color change. Q: When I'm in water screen goes brown. What's the command to prevent the screen from changing color? A: v_contentblend 0. You can also use values like 0.5 which will give you slightly less color change. Q: When Fodquake runs in a windowed mode mouse cursor moves all over the desktop, how to limit a mouse to Fodquake window? Q: I don't see other players' coloured chat on Mvdsv/KTX servers, why? A: Mvdsv/KTX strips colour information from chat for all clients that are not Ezquake. 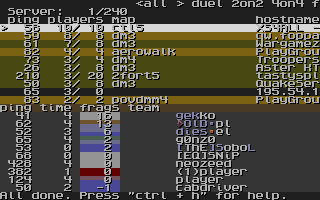 If you wish to see coloured chat on such servers, you must set the cl_imitate_client cvar to "ezquake-1.8.2". Q: How Fodquake was born? A: I'm in France, without all my usual gear, without MorphOS. 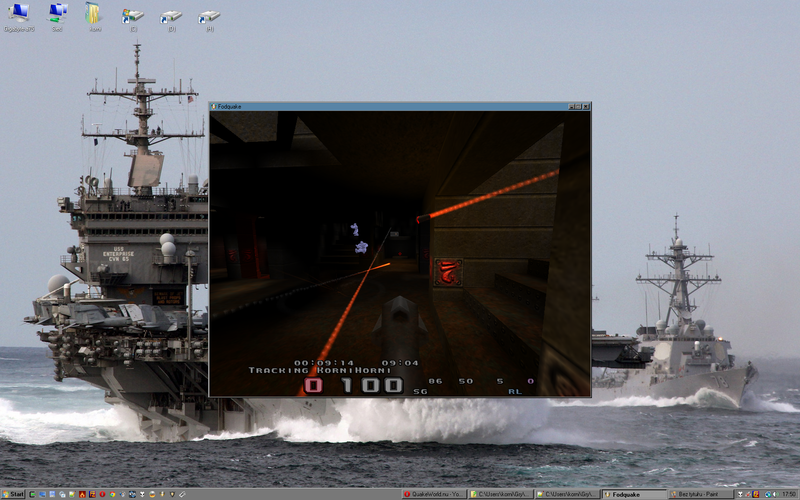 I have an amd64 machine running Linux and I need my Quake fix. I grabbed my Fuhquake/MorphOS sources, fixed up the Linux build and found out that it didn't really work on 64 bit systems. So I spent some time debugging it and making it work on 64 bit systems. That was how Fodquake was born. 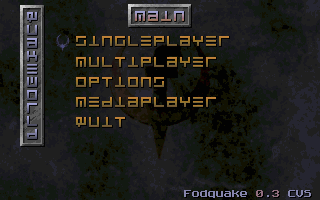 Fodquake is a QuakeWorld client. Multiplayer game. Doubleclick fodquake-gl or fodquake-sw icon. Game welcomes you with a console screen. To show a main menu press the ESC key. Here you can go to server browser where you can start a game, configure player setup, browse and play demos. Brings an option menu where you can customize controls, change video mode, graphics settings, save your config. Shows about screen. Quits the game. You can assign the key/button for each action by selecting the entry and pressing the new key/button. Brings down you a console. Adjusts gamma, you can make your screen darker or lighter using this setting. CD music volume, Sound volume. This menu allows to change a video mode, lists the available modes your system/video card/monitor support. You can change basic graphics options here. There are two preset modes, fast and high quality. Space, Caps Lock, Ctrl - jumps. Left mouse button - fires a rocket launcher. Right mouse button - fires a lightning gun. Middle mouse button - fires a shotgun. TAB - shows a score table. 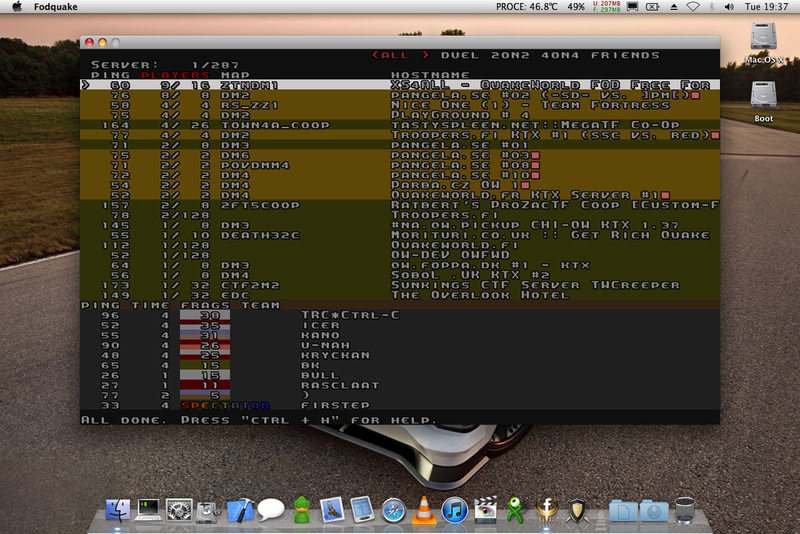 ESC - shows a main menu. ~ - brings down console. Attaches a command to a key. Used without command shows commands actually binded to a key. Note: Enclose multiple commands within quotes and seperate each command with a semi-colon. Remove commands from a key. Removes all commands from keys. Allows you to find a match or a player, add friends. Sorts servers by gametype in columns. Here you can join games, observe, watch EzTV streams via QTV proxy. UP - moves selection highlight up. DOWN - moves selection highlight down. LEFT - switches a selected tab to the left. RIGHT - switches a selected tab to the right. Ctrl, Shift - if pressed, changes jump when using UP, DOWN. Tab - switches selected column. Enter - joins the selected server. Ctrl Enter - joins the selected server as a spectator. Shift Enter - joins the selected server via FTEQTV. Ctrl R - refreshes the server list. Ctrl F - opens a player search box. / - opens a map/server search box. Ctrl H - displays a help. ESC - quits the server browser. You can use one or both arguments. Sets layout of a server browser. Saves a server browser config. Here you can change your name, team, colour of shirt and pants. Sets the color for the player's shirt and pants. Note: If one color is given, shirt and pants will share the same color. Sets the color for the friendly's shirts and pants. Note: If only the shirt color is given, the pants color will match. Sets the color of the enemy's shirts and pants. Here you can browse and play demos. Press Ctrl Enter to timedemo. Captures a demo to frames. Uses demo_capture_fps and (default: "30") and demo_capture_dir (default: "capture"). Jumps to a point in time. Records a demo and names it according to match_* settings. Runs a demo as fast as possible and shows the average fps rate. 1 - hh:mm:ss - current your time. 2 - hh:mm:ss - remaining game time. 3 - mm:ss - current your time. 4 - mm:ss - remaining game time. 5 - hh:mm:ss - current your time. 1 - txt file in crosshairs/crosshair.txt. 8 - char from charset. Color number from a quake palette or a RGB value. png/tga file in qw/crosshairs/. "" to disable. Sets size of a crosshair. In the range of 0 to 20. Allows to either choose distinct colours for walls, floors/ceilings and slopes, or choosing to colour each surface on the entire map according to their wish. Limits go from -1 to 1, colors should be in the range of 0 to 1. Colors should be in the range of 0 to 1. Colors should be in range of 0 to 1. Paints selected part of a wall/floor/ceiling/slope. Removes selected paint from a part of wall/floor/ceiling/slope. Removes all paint from all surfaces. Saves a drawflat config to qw/<mapname>.dfcfg. Rockets - For rocket launcher and grenade launcher. Cells - For lightning gun. Yellow kit - + 15 energy points. max. 100. Green kit - + 25 energy points. max. 100. Mega kit (MH) - + 100 energy points, max. 250. 1 point less per second till player has 100. They respawn 20 seconds after pickup. Green Armour (GA) - 50 armour points. Yellow Armour (YA) - 150 armour points. Red Armour (RA) - 200 armour points. They wear out after 30 seconds of use. Quad - gives your weapons increased firepower. Respawn after 60 seconds. Ring - renders you almost invisible. Respawn after 5 minutes. Pentagram - renders you immortal. Respawn after 5 minutes. Console can be brought down by pressing the ESC key in the main menu or the tilde (~) key when connected to a server. List of all commands, cvars and macros. Sets level of transparency in the console. In the range of 0 to 1. Sets size of the console. In the range of 0 to 1. Some unsorted useful commands and cvars. Sets an upper limit how many frames Fodquake is allowed to generate. 0 means as many as your hardware can do. A description of how to contribute will come when it's ready. In the meanwhile we offer you git://tunkki.dk/fodquake. 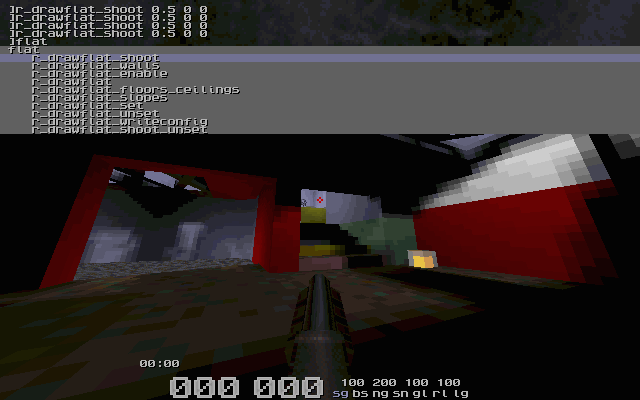 QuakeWorld, FPP game, released by Id Software in December 1996, opensourced in December 1999. Dynamic action, atmosphere, tricks, frags, fun, community, customization, everything makes QW unusual. After many years QW is still popular and considered to be the best multiplayer game. Evolved from FuhQuake, Fodquake takes the experience to a new level, gives you a vast number of enhancements and new features. 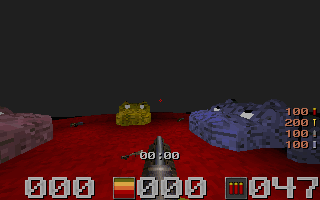 A QuakeWorld client for sensible people who expect (or not) higher level of happiness, so it is easier to frag, die and smile.